A Virgin Australia B737-800 (VH-YIR) with a flight number VA1384 and a callsign VOZ1384 on route from Brisbane International Airport (BNE) to Adelaide International Airport (ADL) has landed without incident in Mildura Airport on the 18th of June, 2013. 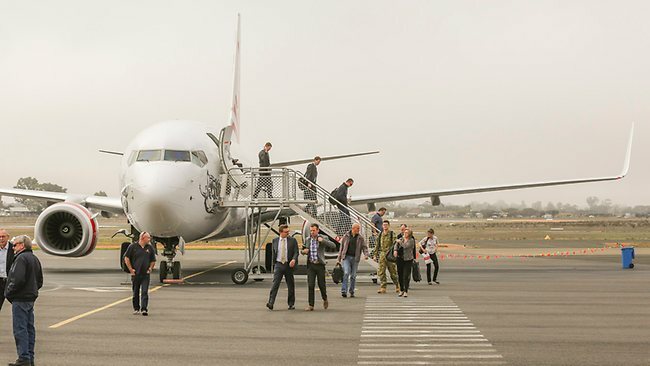 The plane was diverted from Adelaide International Airport and was sent to Mildura Airport approximately 400 kilometers from Adelaide Airport. The plane tried landing at Mildura airport with similar conditions. It aborted landing twice and running low on fuel, to crew declared an emergency landing. After landing the plane was met by emergency crews on the tarmac. A Qantas B737-800 (VH-VYK) flying from Sydney to Adelaide was also diverted to Mildura but no emergency landing was issued. Both planes landed without any injuries. A VIRGIN Australia flight has made an emergency landing in north west Victoria after running low on fuel. The 737, which was travelling from Brisbane, was unable to land in Adelaide this morning because of heavy fog. It was diverted to Mildura, but encountered similar issues. After two aborted attempts to land, the crew made an emergency declaration, and emergency services were sent to the tarmac. The plane landed safely, and all 85 passengers and six crew safely disembarked. A Virgin Australia spokesman said the request for priority landing was made because the plane was running low on fuel, and because of the difficult weather conditions. All passengers would be transferred to Adelaide by this evening, the spokesman said. A Mildura Airport spokesman said a Qantas flight was also diverted to Mildura today and landed without incident. The Australian Transport Safety Bureau says it is collecting information about the incident, and may conduct a formal investigation. Pictures of the Virgin Australia plane involved in the incident. A more detailed article into the incident at Mildura Airport. The ATSB investigation is also included. Passengers leave the Virgin flight that landed safely at Mildura. A VIRGIN Australia flight with 91 people aboard was forced to land because it was running out of fuel. Flight VA 1384 from Brisbane to Adelaide, on June 18, had less than 800kg of fuel when it landed at Mildura after an aborted attempt due to heavy fog. Aviation sources said this was not enough fuel to allow a safe attempt at another go-around, owing to the high fuel burn of a jet pulling out of an aborted landing. Mildura airport CEO Bill Burke, who is also a commercial pilot, said the Virgin pilot should be given a medal. "It (the flight) was committed - it didn't have enough fuel to do another go-around," he said. "I don't think half the people involved know how serious this incident was. "It was committed: they were going to be on the ground in one form or another - either safely, on three wheels, or as a smoking wreck at the end of the runway. That sounds dramatic but it's true. It's factual." The pilot declared a fuel emergency and landed despite fog obscuring his vision until the plane was just 25m above the ground. This was below the usual visual requirement of around 120m. Despite flying "blind", the plane landed safely and the 86 passengers, who had been ordered into the brace position, were not injured. Virgin spokeswoman Jacqui Abbott confirmed there was an investigation into the safe landing of the plane at Mildura. "Virgin Australia is co-operating fully with the ATSB (Australian Transport Safety Bureau) to determine the full circumstances surrounding this event and it would be inappropriate to further comment on the ATSB's ongoing investigation," Ms Abbott said. The plane, a year-old Boeing 737-800, was briefly grounded pending engineering checks. The pilot was using RNAV - an on-board computer system which assists the pilot with landing at specific airports. The ATSB has listed the incident as "serious" and is investigating. The investigation will look at the operations of the automatic weather station at the Mildura Airport. The weather bureau believes it was working, but there was a fault with how the station's information was distributed. The Herald Sun can reveal a NOTAM (notice to airmen) had been issued two weeks before the incident advising that no information was available from the station. Sources also said a weather forecast issued by the bureau before the flight landed at Mildura advised of broken cloud at 3400 feet and no fog. 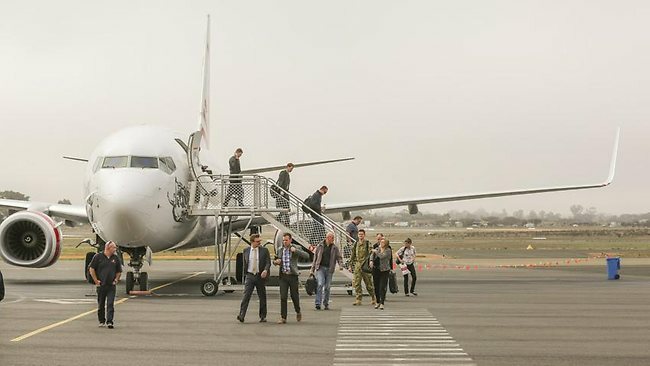 The flight was diverted to Mildura after being unable to land at Adelaide owing to heavy fog, as did an Adelaide-bound Qantas 737 from Sydney. The Qantas flight landed in slightly better conditions minutes ahead of the Virgin flight, and its pilots radioed the Virgin pilots to advise there was visibility closer to the ground. The ATSB is investigating what information was provided by the weather bureau, and what information the Virgin operations centre passed to the five-member crew flying VA 1384. Mr Burke said he was in the airport terminal listening to the radio transmission, and he could hear the engines of the flight as it did a go-around and came in for the final landing. "I didn't see it. The fog was unbelievably thick - the thickest I've ever seen in my life. "That pilot did an incredible job of interpreting all the information. He confirmed that about two weeks before the incident, a notice had been issued that the automated weather station at Mildura was out of service. The ATSB said its investigation would involve a "review of the relevant radio and radar data" and an "examination of the relevant weather observations and forecasts", among other matters. The Virgin flight's "black box" voice recordings have been seized as part of the routine inquiries.